As most of you have most likely noticed by now, I am not so great with the focusing. There's just SO MUCH to do in this house, and everything seems just as important as everything else, so I keep going from thing to thing to thing. I have known that I just needed to pick a room and JUST DO IT. All the way. To the end. No pauses, no exceptions. But I couldn't decide! This is where you came in. I wrote down, off the top of my head, at random, ten rooms in my house that I knew needed to be worked on (which is most of them, by the way). Then, over on the Cottage Magpie Facebook page (I share lots of behind the scenes stuff over there if you want to join the fun) I asked everyone to pick a number between one and ten. I didn't say why or what it was for, just that everyone was helping me make a decision. I knew I'd work on whichever room got the most votes. You guys picked lucky number seven. Are you brave enough to see what's behind door number seven?? 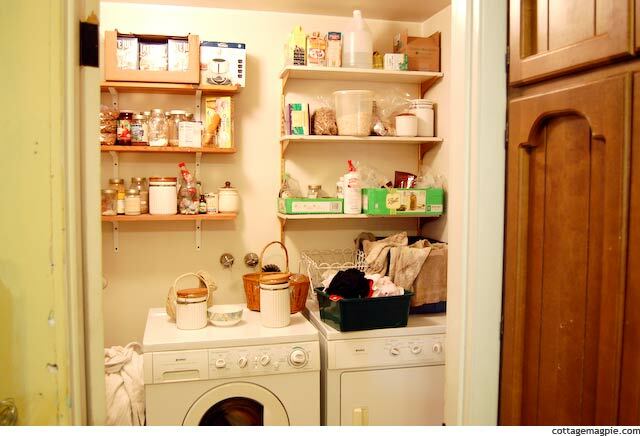 It's my pantry and laundry room! You have actually seen this view before, in True Confessions of a House Gone Bad and the True Confessions Update post. It hasn't changed much, as you can see. You know what's really funny? I really do think this is the most important room for me to work on right now. Our kitchen is compact, which I love, but really requires organization. In addition, we love to buy staples in bulk and put up produce (home canned tomatoes, YUM), so we need lots of storage. So we need to do this room, really badly, just from a sheer functionality standpoint. Of course, if we're going to do all that work we might as well go for aesthetics while we're at it, right? RIGHT! But even though I'm super excited about the project, I had been avoiding it. Partly because we have a lot of open projects already, and partly because it's not the most glamorous project in the world. Which is really silly, but, you know, I'm not always sensible. (That's right, I said it). Here's the really cool thing. Somehow, (and I was hoping this would happen), somehow you guys knew this was what I needed to do. So you voted for lucky number 7, giving it (I promise this is true), seven votes! Oh, and for the skeptics out there, the two runner up projects, by a HUGE margin? The bathroom (the one that's been under construction for *gulp* five years now), and the dining room (the one that I started last fall and is still unfinished). By any measure, those are arguably the next most important projects after the pantry, and in that order. Every other project only got one or two votes, and these got six and five. So yes -- my three most important projects got 7, 6 and 5 votes respectively, and the rest got 1 or 2, even though I wrote them down at random and the voters didn't actually know what they were voting for. This kind of thing amazes me. I'll share more plans for the pantry tomorrow. Meanwhile, I am curious. What's the one project you really need to do in your home that you're not doing? Why?